In 1993, David Wells published a book entitled No Place For Truth: Or Whatever Happened to Evangelical Theology? This book was intended as a wake-up call to an evangelical church that had lost its way, having allowed modernity to replace Scripture as the primary shaper of its thought and practice. This book remains one of the most significant Christian books published in the latter half of the twentieth century. If you know a pastor or seminary student who has not read it, buy it as a gift for them. In his follow-up book, God in the Wasteland, Wells outlines some of the things that will have to be done in order to reverse the situation he described in the first book. In his third volume, Losing Our Virtue, Wells looks at the disintegrating moral culture in America and calls the church to face up to this challenge. The fourth volume in this series of books is entitled Above All Earthly Pow’rs: Christ in a Postmodern World. In this powerful book, Wells confronts postmodernism with the gospel of Christ. Wells’ fifth and final volume was originally intended to be a simple summary of the first four volumes. However, as Wells explains, the book took on a life of its own. 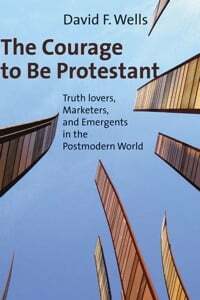 The Courage to Be Protestant: Truth-Lovers, Marketers, and Emergents in the Postmodern World takes up the main themes of the first four books, summarizing what was taught in those volumes and reassessing the whole project in light of the developments of the last fifteen years. The evangelical church, according to Wells, is dividing into three distinct constituencies reflected in the book’s title: classical evangelicals (or “truth-lovers”), marketers, and emergents. Classical evangelicalism, of the type that arose in the years following World War II, was characterized by doctrinal seriousness. Sadly, it was gradually beset by two weaknesses — a growing indifference toward truth and toward the local church. As Wells explains, “Christianity became increasingly reduced simply to private, internal, therapeutic experience. Its doctrinal form atrophied and then crumbled” (p. 8). The church marketers are those who followed the new way of “doing” church developed at Willow Creek Community Church in the mid-1970s. These leaders borrowed the methodology of Madison Avenue, viewing potential church-attendees as the “consumer” and their message as the “product” to be sold. The “emergent” movement is dissatisfied with classical evangelicalism, believing it to be wedded to modernity. Emergents are postmodern and postconservative. As Wells explains, “Emergents are doctrinal minimalists. They are ecclesiastical free spirits who flit around a much smaller doctrinal center and are often obliging of cultural and generational habits. By their very posture they are resistant to doctrinal structure that would contain and restrict them” (p. 17). Wells argues that both the marketers and the emergents have capitulated in different ways to the prevailing cultural winds. He contends that the key to the future is not capitulation but courage — “the courage to be faithful to what Christianity in its biblical forms has always stood for across the ages” (p. 21). In pointing out the rampant insanity that has infected evangelicalism, Wells makes a telling point when he points out that he pities satirists. When pastors preach from the pulpit dressed in a Superman costume and when the worship service contains juggling clowns, nothing a satirist can come up with can outdo the sad reality. Ministers who do or allow these kinds of practices and church members who put up with it need to be told in no uncertain terms that this is nothing short of blasphemy. It makes a mockery of God before a world that desperately needs to hear the serious truth of the gospel. The bulk of The Courage to Be Protestant is devoted to looking again at the truth the evangelical church must proclaim, the truth about truth itself, about God, the self, Jesus Christ, and His church. Our culture has been inundated with relativism, but rather than confronting this self-contradictory nonsense, church marketers try to find ways to sell the church to those who are relativists, while emergents revel in the relativism itself. Rather than tearing down the high places, many evangelicals are content to convert the church into a sanctuary to Baal. We have forgotten that the living God is holy and will not be mocked. We have forgotten the sinfulness of our sin — a sinfulness that required the crucifixion of the Lord of glory. We have traded our birthright, the glorious gospel, for a mess of modern and postmodern pottage. Wells calls all of us to stop and reconsider. It is a much needed reminder.